Home » BLOG » Need help with decision making? Try this. Do you find yourself circling around the same questions as you try to make a decision? Introverts can swirl a lot of information in their minds and end up getting stuck in rumination. Here’s a question you can ask to help with decision making when you don’t know how to decide. Think of how many decisions you are in the process of making right now about your life and work. Many will be complex and important for various reasons. So it’s no wonder we can take a long time to reflect in our attempt to make the “best” or “right” decision. Decisions merit thoughtfulness. The problem is when we get stuck in the thinking and unnecessarily delay getting into action. In the meantime, we see other people doing what we want to do, feeling how we want to feel, and enjoying what we want to enjoy. I can get to that point too – sometimes delaying so much that I decide not to decide, yet still can’t let the question go from my mind. So there isn’t a sense of resolution. And for me, that becomes an energy drain. At some point, it’s simply time to decide. 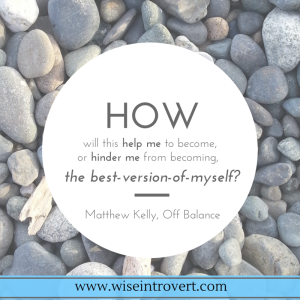 And that’s why I appreciate the question that Matthew Kelly shares in his book, Off Balance: Getting Beyond the Work-Life Balance Myth to Personal and Professional Satisfaction. I love this question because it requires inner work. It taps into values and priorities. It avoids comparison or reference to “should”. It’s a different way to tap into our inner knowing. And, if we believe that our purpose in life is to become the best version of ourselves, then this question gets to the heart of the matter. It’s deeper than, “Will this make me happy?”, or questions of a more logical nature. Few of us will make every single choice in a way that helps us to become the-best-version-of-ourselves. We are human after all and sometimes superficial desires, habits, fear, or compromise will win out (like eating the brownie that I’m craving despite the fact that I know I won’t exercise to compensate or staying quiet when I have valuable feedback or ideas to share). But, in asking ourselves Kelly’s question, at least we can make a more conscious choice. And that’s powerful. GIVE IT A TRY. Ask yourself this question as you decide to decide. Let me know – did it help with decision making?